Fertilizer storage buildings are designed to house hazardous materials such as fertilizers, pesticides, herbicides, fungicides, insecticides, and so on. The storage and handling of fertilizers pose a high risk to ground or surface water, especially if there is a leak or spill. Proper fertilizer storage buildings reduce the risk of groundwater contamination and provide a separate storage compartment for incompatible materials. Pesticides and fertilizers should be stored separately to minimize the possibility of cross-contamination, a hazardous situation or creation of hazardous waste in the event of a fire or explosion. Fertilizers should be stored in a cool and dry area. A fertilizer storage building should be locked and all doors should be labeled to prevent access from personnel and the public. Liquid pesticides should always be stored in an air-tight container that is fully leak-proof. The storage building should be separated to prevent cross-contamination, and inventory should be labeled and dated accordingly. Liquid pesticides should be kept in a dark, and cool storage container. A secondary sump containment is essential for pesticide storage and must be implemented in your chemical storage building. 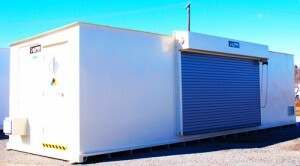 Pesticide storage buildings should be a safe and compliant storage solution for your pesticide inventory. Your pesticide storage building should remain locked and properly labeled minimizing the chances of a hazardous situation. Pesticide storage buildings should be fully compliant with all EPA, OSHA, and NFPA regulations. U.S. Chemical Storage provides a safe and compliant way to store your fertilizer and pesticide storage. We offer 100% customizability to all of our fertilizer storage buildings. Our storage buildings are hand-welded from heavy-duty, 12-gauge steel for superior construction. All of our fertilizer storage buildings are made in America, so you can be assured that every storage building we manufacture is extremely strong and durable. Our buildings are weatherproof, giving you the added protection against severe weather conditions. We offer a wide-variety of chemical storage accessories including exhaust systems, explosion proof lighting, electrical accessories, ramps, racks and more available online. Make sure your fertilizer storage is safe, maintained and 100% compliant with all state regulations. U.S. Chemical Storage offers expert advice on all of our chemical storage buildings, while providing the safest and most secure chemical storage buildings on the market today.